Ugh… Ever since I got past AR Tier 11, I just can’t seem to get any more Lift. It’s strange. I’ve been trying ever so hard to raid other keeps, but that doesn’t seem to change anything. What’s strange is that you haven’t done anything to strengthen your defensive map. You can’t just focus on offense. 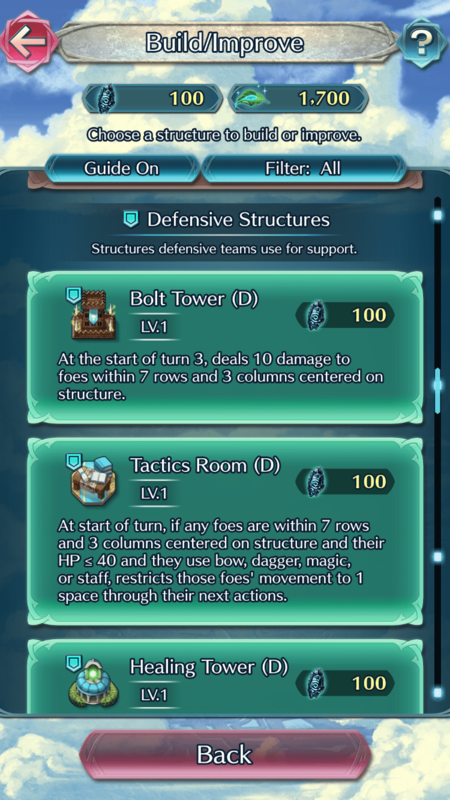 You need to prepare for your foes’ attacks as well by placing structures on your defensive map and assigning a defensive team. B-but Alfonse! Don’t all the strategists say the best defense is a good offense? That’s more of an adage than a strategy. When it comes to Aether Keeps, it’s just as important to get your defensive map in good shape. Once you reach AR Tier 11, you will lose Lift if you fail to defend your keep. When your AR Tier is around 10 or so, you should look to work on your defensive structures and team so that you can successfully defend your Aether Keep and be able to defeat as many members of your opponent’s raiding party as you can. One key part of this strategy will be to keep on top of strengthening your Fortress (D) to ensure that it doesn’t have a much lower level than your opponent’s Fortress (O). Auto Setup will let you try several arrangements for your defenses, so take advantage of it while you’re still getting used to how the structures work and where to best position them. When you feel like you’ve got the hang of it, try customizing the placement of structures to step up your defending strategy. Additionally, Auto Setup will place bonus structures automatically, which can help when planning layouts that include these structures. 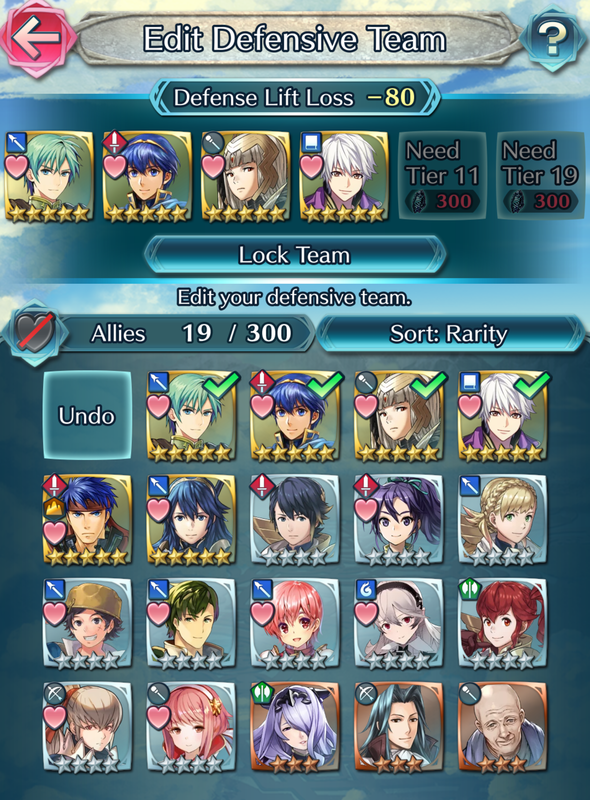 You can have up to four allies in your defensive team when you’re starting out, but after increasing your AR Tier, you can have up to six allies (at a cost of 300 Aether Stones per ally). Don’t hesitate to include your strongest allies and any Heroes who are currently designated as bonus characters. 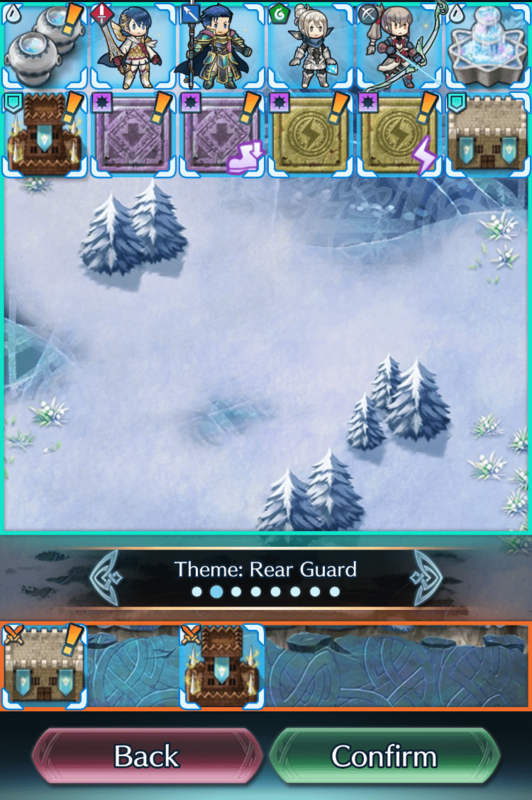 You can also lock your defensive team so that they will always go into battle using skills and Sacred Seals oriented toward your Aether Raids strategy. Please note that if your AR Tier falls to 18 or lower after you’ve increased the capacity of your defensive team to six allies, the capacity of the team will then be reduced to five.